I’m Jodi and I have been blessed to be following a path throughout the healing arts for over 15 years. While living on the beautiful west coast of Canada I attained my massage certification while working with athletes in the area of sport medicine and studying kinesiology, with this experience I continued my studies and went on to attain my bachelor of science in physiotherapy, and further completed 2 years of postgraduate work in medical acupuncture. 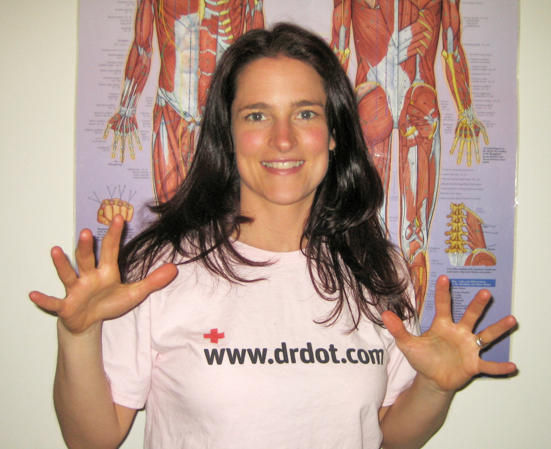 I have 10 years of experience working in private practice setting with all kinds of clients, injuries, and imbalances. With this background I have built a solid understanding and knowledge of the human body and healing from both a western and eastern perspective. This, combined with my hands innate natural intuition, enables me to easily and effortlessly seek out any “hidden dragons” or relieve or relax any tensions whether new or 20+ years old! No words are necessary! My techniques can range from deep, deep, deep did I mention deep and yes sometimes somewhat painful ( the good pain☺ - of course) to silently deep, painless and powerful, often bringing profound changes quickly, it all depends on the individual! NO two massages are the same! As love and life has now brought me to the east coast to live in this beautiful city of Montréal, it has also brought me the great opportunity to work as part of Dr. Dot’s amazing team of massage therapist! What better way to combine the things you love massage, healing, music and travel! When passion is shared only great things can happen! I look forward to massaging you, your crew, your family, your friends and anyone else you want to bring along!